Highly anticipated: Nvidia just revealed an October 17 release date for the RTX 2070. Although we'll have to wait for the benchmarks, it arrives as a powerful card that is within reach for far more enthusiasts than the top of the line options. Following the GeForce RTX 2080 and RTX 2080 Ti, Nvidia is now readying the launch of the more affordable GeForce RTX 2070. 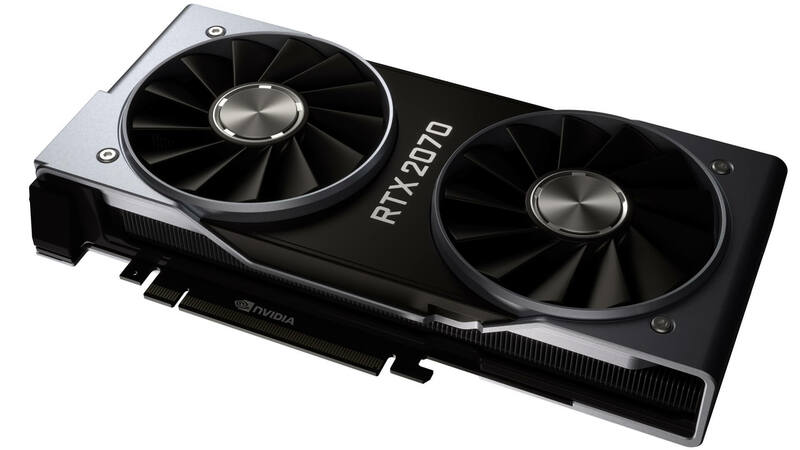 October 17 will be the day that the GeForce RTX 2070 finds its way into online marketplaces and stores. Nvidia's Turing architecture offers a factor of six performance gain in ray tracing compared to the previous generation, but as we learned in our recent RTX 2080 review -- or rather, didn't learn -- we have no idea what that means with no possible way to test ray tracing and take advantage of the latest generation GPU's most important feature. Considering the lofty prices of the RTX 2080 Ti and RTX 2080, the still powerful RTX 2070 will be of consideration by a larger audience of gamers looking to upgrade and check out the fancy new lighting made possible by Turing... once again, when we find out how feasible it is to turn those on current generation boards. RTX 2070 Founders Edition cards have a boost clock that can reach up to 1710 MHz compared to the standard 1620 MHz. The Base Clock is set at 1410 MHz for all RTX 2070 models. Both versions arrive with 8GB GDDR6 memory with memory speeds up to 14 Gbps. Utilizing a 256-bit memory interface, bandwidth measures in at 448 GB/s. Cooling on the Founders Edition consists of two 13-blade fans with a newly designed vapor chamber. A 185W power rating has been given to the Founders Edition while the standard model is rated at 175W. Video output consists of DisplayPort, HDMI, USB Type-C, and DVI-DL ports. As always, other manufacturers may offer different configurations of output options. Those wishing to obtain Founders Edition cards can expect to part ways with $599, while board partner offerings are expected to come in many different flavors starting at a more attractive $499 for the vanilla models.